Printers can sometimes encounter a lot of different problems that can be difficult to troubleshoot. One of the more annoying symptoms that may crop up is that a printer starts printing blank pages instead of the output you are expecting. 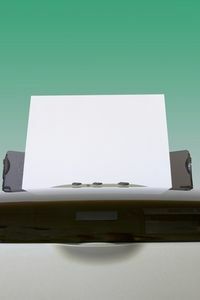 Printing blank pages can often caused by an incorrect printer driver installed on the computer, or one that has become corrupted. The best solution in this case is to track down the correct driver and install it. See Installing a Printer Driver for details on how to install correctly. In some cases, a communication error due to a loose cable can cause blank pages. First, turn off the printer. Unplug the USB, parallel, or ethernet cable from both the computer and the printer, then reconnect both, making sure they are securely inserted. The first thing to check is to make sure that your inkjet or toner cartridges are not empty. You can generally view the level of ink or toner available on the control panel of the printer or in the software on your computer. The print spooler is responsible for managing multiple print jobs. Reseting the print spooler could resolve the issue. Click the Start button and type “services.msc” in the box (without the quotes), then hit Enter. Right-click the “Print Spooler” heading and click “Stop”. Then right-click the “Print Spooler” line again and click “Start”. Print a test page to see if the problem is resolved. When inkjet print heads become clogged, they can have trouble transferring ink to the page. By running the print head cleaning utility, the printer will attempt to flush the heads to get them working again. For most models, you will open the printer software and go to the Tools or Utilities section and choose the print head cleaning utility. Consult your manual for specific instructions for your model. For models with removable printheads, Canon models in particular, you can try manually cleaning the heads. See the video below. With any luck, the issue of printing blank pages will now be resolved. If you are still having problems with your printer, you may need to try a repair shop or contact the manufacturer for more detailed information.